The cameras on NASA’s Curiosity rover usually look down at the rocks on Mars, divining clues in the minerals of what the planet was like billions of years ago. Sometimes though, the rover also looks up, and in March it spotted two eclipses (eclipsi?). Eclipses on Mars are not as total as those on Earth where the moon completely blots out the sun. The two moons of Mars are tiny. Phobos is 7 miles wide while Deimos is even tinier, just 1.5 miles in diameter. They only partially block the sun when they pass in front of it. The camera on Curiosity’s mast is equipped with solar filters that allow it to look directly at the sun and photograph eclipses. On March 17, Curiosity observed Demios eclipsing the sun. Nine days later, it also spotted Phobos passing in front. The observations by Curiosity, and by earlier NASA Mars rovers, Spirit and Opportunity, enable more precise pinpointing of the moons’ orbits, which are jostled around by the gravity of Mars, Jupiter, and even each other. Although Phobos and Deimos are small, the details of their formation are of considerable scientific interest. Japan’s space agency plans to send a spacecraft to the two moons within the next decade. The Mars Moon Exploration probe, or MMX, will collect samples and return them to Earth for study. A panel of scientific experts recently approved the sample-return phase of the mission. Methane gas is periodically detected in the atmosphere of Mars. This was once considered implausible and perplexing, but it is now widely accepted by planetary scientists. Why the methane is there is still a mystery. It could point to present-day Martian microbes living in the rocks below the surface. Scientists working with the ESA’s Mars Express orbiter reported that in the summer of 2013, the spacecraft detected methane within Gale Crater, a 96-mile-wide depression near the Martian equator. In the same summer of 2013, NASA’s Curiosity rover also measured a marked rise of methane in the air that lasted over two months. The presence of methane is significant because the gas decays quickly. Calculations indicate that sunlight and chemical reactions in the thin Martian atmosphere would break up the molecules within a few hundred years, so any methane detected must have been created recently. It could have been created by a geological process known as serpentinization, which requires both heat and liquid water. Or it could be a product of life, specifically methanogens, microbes that release methane as a waste product. Methanogens thrive in places lacking oxygen, such as rocks deep underground and the digestive tracts of animals. Even if the source of the methane turns out to be geological, the hydrothermal systems that produce the emissions would still be prime locations to search for signs of life. A newer European Mars spacecraft, the Trace Gas Orbiter, which has a more sophisticated methane detector, has been in orbit since 2017, but no results have been reported as of yet. Since NASA’s InSight lander, um landed on Mars at the end of last year, the plucky surface probe has spent months getting carefully situated so that its special seismometer could listen for “marsquakes” a neologism for earthquakes that occur on Mars, rather than Earth, as you probably guessed. Observations of marsquakes will help determine just what’s going on inside of Mars, and to what extent it is still a geologically active world. 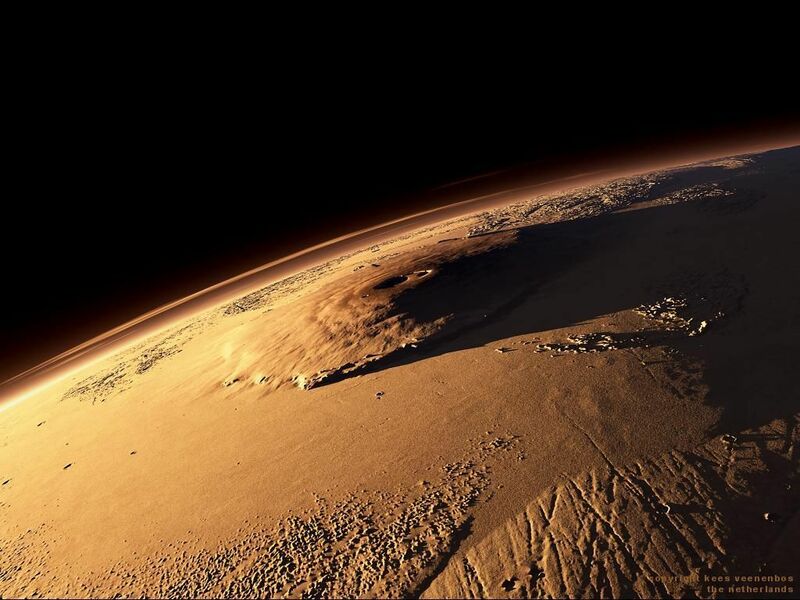 We know Mars was very geologically active in the past; it has the tallest mountain of any planet in the solar system. While InSight hasn’t heard mars-shaking marsquakes yet, Scientists have revealed that the lander’s instrument has detected a different kind of rumbling known as microseisms. They are the first of their kind to be detected on another planet. The new noises are caused by low-frequency pressure waves from atmospheric winds. On Earth, microseisms are caused by the ocean, storms and tides. Researchers working on InSight hope to hear a real marsquake within one month. InSight’s other instruments have been providing scientists with troves of data. Indeed, since mid-February, InSight has issuing weather reports from Mars. Ultimately, InSight’s science will help contribute to an overall picture of the history of the solar system, and how Mars, Earth and the other planets formed and evolved. The Auxiliary Payload Subsystem (APSS) lets InSight provide more frequent weather information than any previous mission to Mars. InSight’s science will help contribute to an overall picture of the history of the solar system, and how Mars, Earth, and the other planets formed and evolved. The Milky Way Galaxy (the one we’re in) contains an estimated 200 billion stars. But that’s just the tip of the iceberg, the Galaxy is surrounded by vast amounts of an unknown material called “dark matter” (matter that we can’t normally detect because it doesn’t interact with the electromagnetic spectrum). Astronomers know it exists because, dynamically, the Milky Way would fly apart if dark matter didn’t keep a gravitational lid on things. Still, astronomers would like to have a more precise measure of the Galaxy’s total mass to better understand how the myriad galaxies throughout the Universe form and evolve. A team of researchers from ESO, the Space Telescope Science Institute, the Johns Hopkins University Center for Astrophysical Sciences, and the University of Cambridge combined observations from the NASA/ESA Hubble Space Telescope and ESA’s Gaia satellite to study the motions of globular star clusters that orbit our Galaxy. The faster the clusters move under the entire Galaxy’s gravitational pull, the more massive it is. The team concluded the Milky Way has an equivalent mass of 1.54 trillion solar masses, most of it locked up in dark matter. This new mass estimate puts the Milky Way Galaxy on the beefier side, compared to other galaxies in the Universe. The lightest galaxies are around a billion solar masses, while the heaviest are 30 trillion, or 30,000 times more massive. The Milky Way’s mass of 1.5 trillion solar masses is fairly normal for a galaxy of its brightness. Previous estimates of the Milky Way’s mass ranged from 500 billion to 3 trillion solar masses. This huge margin of error arose primarily from the different methods used for measuring the distribution of dark matter, which makes up about 90% of the mass of the Galaxy. Given the elusive nature of the dark matter, the team had to use a clever method to weigh the Milky Way, which relied on measuring the velocities of globular clusters, dense star clusters that orbit the spiral disk of the Galaxy at great distances. The scientists used Gaia’s second data release, which includes measurements of globular clusters as far as 65,000 light-years from Earth, as a basis for the study. Observations from Hubble allowed faint and distant globular clusters, as far as 130,000 light-years from Earth, to be added to the study. As Hubble has been observing some of these objects for a decade, it was possible to accurately track the velocities of these clusters as well. NASA’s Juno spacecraft, currently orbiting Jupiter, took a dramatic image of the gas giant earlier this month. The color-enhanced image comes from Kevin M. Gill, a NASA software engineer who moonlights as one of the Juno’s amateur image processors, shows a large circular storm trailed by clouds swirling in a jet stream in Jupiter’s northern hemisphere. Juno has been in a highly elliptical orbit around Jupiter since 2016. The spacecraft captured the image on Feb 12, during its 18th close pass of the planet. Juno was just 8,000 miles above Jupiter’s cloud tops at the time. First launched in 2011, Juno took five years traveling to Jupiter from Earth. The mission seeks to map Jupiter’s interior and determine how much water is inside the planet, among other goals. Scientists hope that by studying Jupiter, they will have a better understanding of how the planets formed. NASA makes raw images from Juno available to the public online. The agency encourages amateur astrophotographers to download and enhance the images before uploading them back to Juno’s website. Dozens of space enthusiasts have participated, some by simply cropping the images and others by performing advanced color reconstruction or highlighting a particular atmospheric feature of the planet. NASA plans to end Juno’s mission in July 2021, at which point the spacecraft will self-destruct in the most metal way by hurling itself into Jupiter.